Mission: Admission is a strategy game about navigating the college application process, developed for high school students in collaboration with the USC Pullias Center for Higher Education. 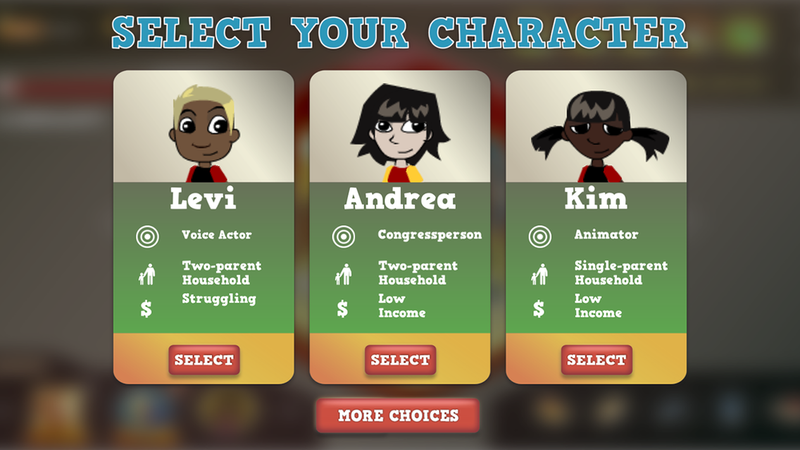 In the game, players choose a character and help them build an impressive application and pick the colleges and scholarships they should apply to. Each game presents the player with a field of deadlines that play out in real time over the course of a week, and success requires both planning and time-management skills. Mission: Admission was created by the USC Game Innovation Lab as part of the FutureBound Games suite. Mission: Admission was first published in 2012, as a follow-up to the card game Application Crunch. I was both part of the initial design team and the technical lead throughout the project. The initial version of the game was programmed in Adobe Flash, and released on Facebook. In 2016, the game was reprogrammed in Unity 3D to make it compatible with modern web browsers and tablet computers. It is currently being used in a large-scale longitudinal study as part of a Department of Education First in the World grant to the USC Pullias Center for Higher Education, with plans to release it publicly after the study concludes. The gameplay of Mission: Admission was heavily inspired by popular Facebook games of 2012, which commonly used the frustration of time-gates to drive viral behavior and microtransactions. We recognized that these mechanisms could also be used positively to force long-term planning and time management, and designed a system around training those skills. Like Application Crunch, Mission: Admission uses abstract simulation to teach students about the process of college application.